What a crazy, crazy year 2011 has been! Usually I write twice a year. But in June, instead of writing The Student’s Desk, I was remodelling The Student’s Desk. And for half of December, I wasn’t even to be found in the country! More on these in a minute. 2011 began where 2010 finished – in Melbourne. I returned to Melbourne in January to do the second half of my block placement. This time, I was working much more closely with CBM (Christian Blind Mission) preparing training modules for their Luke14 program which looks to equip churches to be more inclusive of people with disabilities. By year’s end, I found myself becoming one of the volunteer regional co-ordinators for both Central Coast and Sydney. This means I’m part of a team that visits churches to run a training seminar, among other things. This also led to the opportunity in September to present a theological approach of relating to people with disabilities to couple hundred men at a ‘Men for Christ Ministries’ conference with Rob Nicholls from CBM. In March I graduated with my theological degree, and was also awarded the ‘Koorong Prize’ for Excellence in Biblical Studies. This was unexpected, and I felt very honoured to receive this prize. It was a brilliant night for all, being reminded of the biblical truths we hold to. I was so glad to have many of my family and friends there to mark the occasion. I wasn’t so crazy about wearing a tie, though! As exciting as it as to graduate, it was a bit of an anti-climax to wake up the next morning to more essays as I continued working towards my Advance Diploma of Theology – required for ordination in the Presbyterian Church. Studies in first semester included Grace and Eschatology, and John’s Gospel (in Greek, of course!). Eschatology led me to engage with the millennium debate, which discusses the circumstances of Christs return. I’m not sure if I fully understand the debate, and I’m not sure if many people do! What did astound me is no one has seemed to venture to explain how the millennium is functioning in the text (Revelation 20:2-7). I would’ve thought it was a fairly fundamental question, but apparently that’s the wrong question for a systematic theologian to ask (??). I hope to make some progress in answering this question myself before returning to college this year. Studying John’s Gospel gave an up-close and personal insight into the person of Jesus, and was again confronted by the significance of Jesus, and the fallen state of the world. The mid-year break saw the remodelling The Student’s Desk, which was a much bigger project then I had imagined. You know how it is – you start working on one thing which leads to another, which leads to another, which leads to “I should never have started this!” Such was the remodelling. 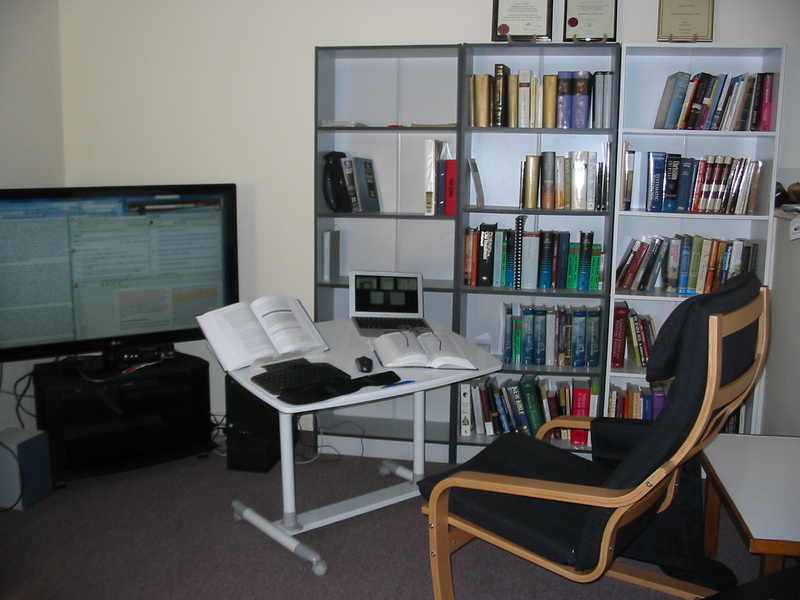 I had the idea of moving my studying out from the 2nd bedroom to the loungeroom for over 2 years, centred around a large, custom-built desk (which I had already drawn up plans). Then I had a brainwave (always a dangerous thing with me). With modern TVs having the ability to be used as a computer monitor, why not buy a big TV, hook up my computer, then get a table on wheels to place a wireless keyboard and mouse with enough room for 2 or 3 books? With the analogue TV signal being phased out, I would’ve been buying a new TV anyway. Well, that’s exactly what I did, along with buying some storage draws and cupboards, and it’s worked really well. Even though I had people assembling and moving furniture and cleaning the place up, it was still a big effort for me getting all the bits together, and moving books is not easy! I’m just glad the vast majority of them are on my computer. This time also saw the addition of new technology – a Mac, of all things! After years of taking the micky out of them and those who own them, I bought a Macbook Air. What I’ve wanted was an “up-and-go” mobile computer. None of this turn it on and wait for something to happen. And wait, and wait, and wait! Hence why I previously bought an iPad, but found it too limited in what it could do. The Mac has surpassed all my expectations, allowing me to take it everywhere and to work anywhere on a full computer system that’s responsive and reliable. I’ve found myself a few times commuting to college on the train preparing a talk. I’m so impressed with the Mac, I’m now looking to replace my main computer with one, once Apple starts putting today’s technology in them, and not yesterday’s! After 10 years, services at the Allambie Heights Cerebral Palsy Alliance (formerly NSW Spastic Centre) continue. Recently we’ve been slowly working our way through John 14-16, looking at what it means to be a follower of Jesus. I’ve found this very interesting and quite confronting, yet encouraging. What’s been noticed is Jesus makes some big demands on his followers, but he doesn’t leave them to their own devices. As Christians, we are given all we need to do Jesus’ bidding, and we mustn’t ever forget that grace! It’s also been encouraging to see new people come along and participate, if only for a short time. In the latter half of the year, I also frequently found myself in a school surrounded by ten year 2 students, teaching the Bible. I wanted to learn how to relate to kids, and in the first half of the year returned to assisting with Scripture in a special education school. I was unable to continue in the second half of the year, and was reassigned to another class at a mainstream school, except, I wasn’t to be an assistant. I was to be the teacher! Oh boy! How on earth was this going to work?? The kids were attentive, and I did have an assistant to help with communication. The school was also very supportive of what I was doing. Again, technology came to the fore as I quickly learned how to use a smart board to present lessons. In the second half of the year, I took another 2 subjects: Pastoral Skills and Methods and Synoptic Gospels (again, in Greek). I found Pastoral Skills really helpful for ministering to people one-to-one, although I really didn’t like writing the essay on ‘divorce’, but understand why that topic was chosen. Synoptic Gospels really enforced the importance of reading the books of the Bible as literary units, and not isolate passages and interpreting them by ones own presuppositions, as significant as they may be! I finished my lectures for the year, and from then on, life became really crazy! I thought I had 3 leisurely weeks to learn 6 chapters of Luke (in Greek) in preparation for my exam, and to pick up my fitness for my upcoming block placement in New Zealand. Our legal system had other ideas. I was summons to jury duty which reduced my study time to 1 week. Any thought of getting back on my bike went out the window as I crammed 5 out of 6 chapters into my head. Then it was a case of completing the exam one day, packing my bags for New Zealand the next day, board the plane the day after, and run around New Zealand non-stop for 3½ weeks. After all this, I popped out the other end with a High Distinction for Synoptic Gospels. Don’t ask. I’ve got no idea how that happened either. I’m just chalking it up to God’s providence! While I’m relieved to have completed the Greek side of my studies, I’m also disappointed it’s finished. As crazy as it may sound, I really enjoyed getting into the Greek text. I am very glad that I insisted on doing Greek, and am thankful to the college for their support. New Zealand was a huge effort, but well worth it. I can’t imagine flying off to another country for the first time on your own is much fun for anyone, much less someone with a disability. But, this is what I did. I was still experiencing difficulty getting a field placement for my studies when this opportunity with Christian Ministries with Disabilities Trust in Auckland came up. I went back to my college and negotiated to do a 2nd block placement in lieu of a field placement. So the endeavour to become a Presbyterian minister became an international effort! New Zealand was a fantastic experience with friendly people who have a tremendous sense of humour. One person tried telling me I was from the ‘West Island’. I had to pay that one. There was plenty of opportunity for me to preach and teach, encouraging people one to one, and try my hand at other ways of presenting. It also gave me an opportunity to find out the inner workings of CMWDT, and start thinking about what might be possible in Australia, and the best way of maintaining Biblical standards. I really enjoyed my time in NZ, although there were some very difficult moments. So it was with a measure of sadness that I boarded the plane to come back home. 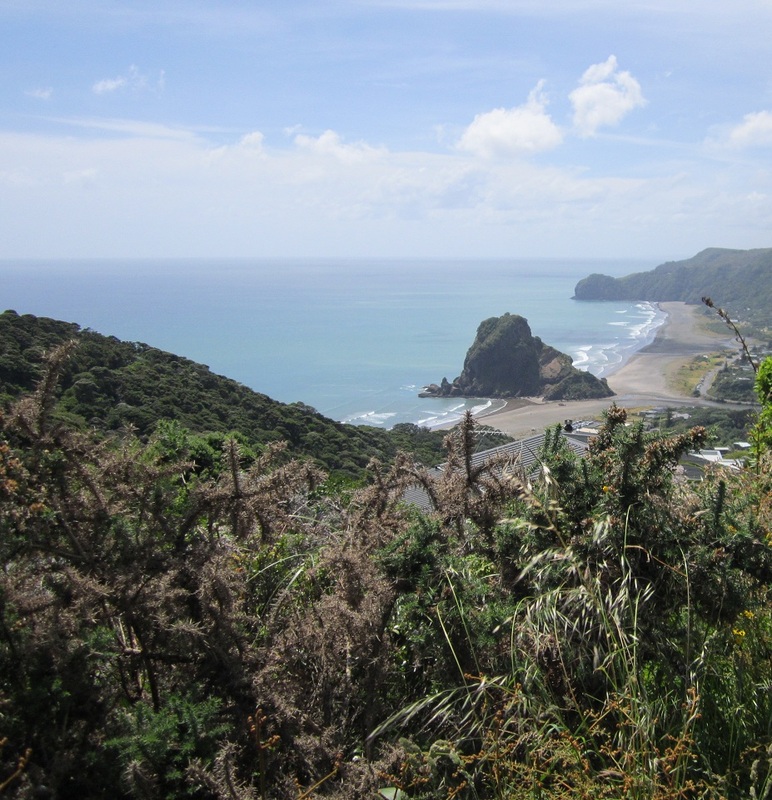 The photo on the left is Lion Rock at Piha. Looking to the year ahead, it’s shaping up to be a quiet one on the study front, but I’m anticipating this will be a very busy year. It is with immeasurable joy that I can say this will be my final year of study (at least for this course). I only have Hebrew to learn (how hard can that be?? I was also told Greek would be hard! ), and my exit thesis to write. Beyond this, I am praying that opportunities will be opened up around the Central Coast and Sydney, and I’m already seeing some movement on the horizon. It will be very interesting to see how this year unfolds.